Do you work for Keynote? "Great alternative to PowerPoint. " 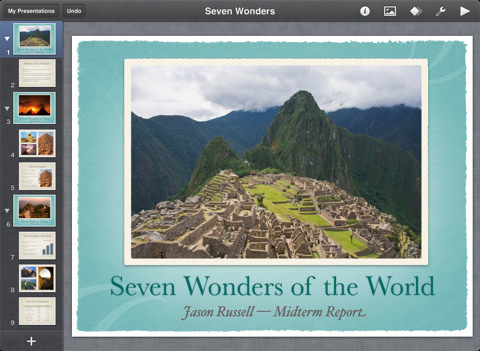 Keynote creates files that can be used with Microsoft Powerpoint. Excellent templates that I can use to create a fun, yet professional presentation. There are also a lot of hidden features, which is why I prefer it over Powerpoint. Another benefit of Keynote is that it comes free with the purchase of a new Mac, iPhone, or other IOS device. "Handing" off your documents works with little to no trouble. Non-Mac users might struggle when trying to use Keynote. The interface, gestures, and set up will be confusing to non-mac users because it is something they are used to. Recommended for Mac owners hesitant on paying extra for Microsoft Office. Our office uses Macs and for us, we don't have to pay more money out of pocket having to buy Microsoft Office. User-friendly with apple devices. There are a lot of visually-appealing templates to choose from when creating a presentation. There are also a lot of interesting animations to make your presentation engaging. "The Swiss Army Knife of Visuals"
There are many things to love. Everything from creating elegant presentations for school and work, with or without transition animations to actually creating stunning graphical elements for mock-ups is just up the alleyway for a lot of individuals looking for a tool that fulfills a lot of needs. Blessed with simplicity in the UX and UI at its foundation, not only does Apple Keynote have next to no impact of battery life, but it's a tool for just about everybody. In certain niche cases, a lot of the more advanced tools or options feel sort of undocumented and require a little bit of searching to find. Additionally, certain tools that modify shapes to ones content are not as fleshed out as other applications on the market, but this is really a non-issue, as the price-tag of "FREE" justifies a lot of its shortcomings. If you are looking for a base tool at your arsenal that acts as a filler of sorts. Being available for use in a ton of use cases, it is worth utilizing provided you have a Mac and it is well worth anyones time to learn; especially since one can learn its toolset very quickly. Be it creating advanced, animation required presentations for class or business, or just visuals to get the point across; the main feature set of Keynote, primarily being a Microsoft PowerPoint competitor, it does presentations well. It also is a potent tool for UX designs. When designing a mock-up for designers and developers to incorporate, one can create quite amazing results with the options one has at their disposal. No complaints there. A more uncommon use of this tool is its ability to convert files from one file-format to another. It has a nice array of options. Some types I convert my projects to the most are the .key, .pdf, .pptx formats, with varying quality options, password protections and whatnot. "Keynote is great for simple presentations"
I like the simplicity of using Keynote for projecting words during worship services. I dislike that I haven't found a simple way to embed videos into Keynote, instead of having to get out of Keynote to a web browser. I would say, if you're looking for a simple program, this is the one for you. It's extremely easy to use and easy to figure out as an Apple user. If you're looking for a more complex presentation system--this could still be for you, but I can't speak to that, because we keep our presentations pretty simple and unobtrusive. Keynote has helped people at our church follow along with our worship services. It's aided our goal--to help people trust more firmly that Jesus has taken away all their sins freely and promised eternal life to all who simply trust in him as their Savior from sin. Keynote has also been simple to use in order to export title images to iMovie creations. "Create Presentations - In Any Format You Need"
Keynote lets you create presentations that engage!, and in any format. You get a small number of templates, with stunning images and you can use them as a base and customize them from there. Once you're done you can save multiple versions, then send it out to your audience in any format you need: Pdf, word doc, auto-play slide show, with just one click. Keynote is exactly what Apple was built for - designs that engage your best audience. Having newly converted from a PC to a Mac, I did have trouble getting used to Keynote. But I learned and now see great benefit from using it. The other challenge is, if who you are sending a Keynote file to doesn't have Keynote, they just can't open it. It doesn't convert on it's own like so many other packages do. The solution is to ask first, then send a word doc, after you've completed the design in Keynote. If you haven't switched from PCS to Mac, now's the time. The visuals you can create to engage your customers using a Mac and Keynote are what will win you far more business than without. Be patient, it's not an easy switch, but once you get down the learning curve, and see the results, you'll be glad you did. We had switched from PC to a company of Macs and MSFT 's Powerpoint wasn't working out at all. We also wanted to capitalize on the design capabilities of Apple. "Create more powerful presentations with Keynote"
Keynote is a more advanced presentation tool than PowerPoint. It integrates with MacOSX, and even allows you to control the presentation from an Apple remote or an iPhone. My favorite feature is that I can embed a playable video file into the presentation, which eliminates the need to have a web browser open in the background. I am able to show a video to my audience without having to stop my presentation and go to the web browser, then return to the presentation, and try to find where I was. iCloud integration could be better. Presentations lose features and slow down significantly through iCloud. Though you are able to import and export powerpoint files, many features and fonts are lost. 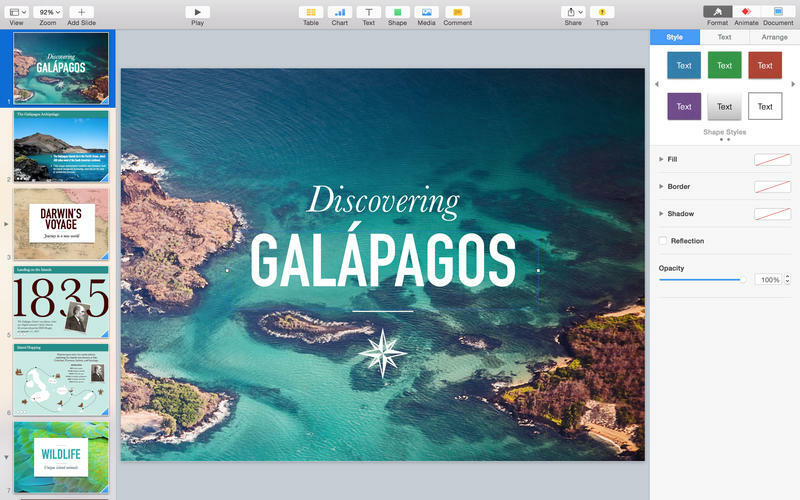 If you are primarily a Mac user who has to present to colleagues, conferences, or students, Keynote provides an easy to use tool that is more powerful than PowerPoint. As a classroom teacher, I use presentations on a daily basis, both to teach my classes and also to provide some sort of visual aid in the classroom. I also use Keynote when I present professional development activities for my coworkers. Keynote, unlike Powerpoint, is super intuitive to use because of the simple user-interface and limited, yet rich, set of options. Putting together interesting slide decks is quick and painless and the process is nearly self-explanatory with a little bit of poking around at the feature set. I also like that you can prototype interfaces for mobile devices using Keynote. There's not a whole lot to dislike but since it is not After Effects (which has an insanely deep learning curve), you cannot control your animations to the degree you can with a real animation software like After Effects. I wish there was great control of the animation speeds and ways to animate more objects. I'd also love more control in the video output or export option but again it's a presentation software and not an animation software. However, if there's anything Apple could improve, it is to make some of the animation tools more sophisticated (adjustable). Push the software as hard as you can; it can really help you make great presentations. I use Keynote for all presentations but I also use it to prototype apps such as mobile phones and tablets. The fact that Keynote runs on both the iPhone and iPad means that I can prototype interactives using my phone or iPad which is really powerful. "Aesthetically pleasing and captures attention! " I really like the professionalism of the program itself and how it captures the attention of the audiences that I have presented to. Time and time again, audience members say, "your presentations are amazing, how did you create that?" and I smile and say, "keynote" and then we have a great conversation. I like how you can transform a picture and use it to capture the right elements and overlay text. It's one of the most amazing applications I have ever used. The time that it takes to produce a high quality visual is the major downfall for me, but, as a beginner, you don't have to put that much time in it for you to get the results you want. I'd highly consider this if you want polished, professionals that audience members will remember. Using keynote is definitely not something you can put off to the last minute if you are looking to put together a stellar presentation. Easily communicating information across to audience members and the benefits include me having each slide different to communicate with ease. "Using Keynote to up your game"
Keynote's use of animation in the presentations is a great use for those that aren't quite an expert designer yet. I especially like the transition animation where you can take one shape and morph it into another in the presentation. This aspect really elevates Keynote from other presentation tools out there. It is not that I dislike this but a downside to keynote is that it is made for Mac, which as a designer is great for me since I work off of Mac's but for others it can be difficult to access when a PC is your go to computer. The cross platform technology is still butting heads between the two platforms and I'm not sure this issue will ever be resolved. Keynote will help you accomplish your presentation goals while adding ease of use. the overall experience for using this product is pleasant and makes you want to continue using it. Presentations for clients and potential clients. Trying to sell our product and demonstrate the best way to use so that the clients can get the most out of it. "Great for much more than presentations"
It's so fast to work with. Creating basic shareable graphics using InDesign or Illustrator takes a long time and has a steep learning curve. Making graphics with Keynote is incredibly fast and easy. Of course I use it for presentations, but I also use Keynote as a general illustration tool, or even a quick photo editor to knock out backgrounds, because the Instant Alpha tool "just works." Keynote is not "supposed" to be an illustration tool, so it doesn't save non-standard slide sizes. You have to adjust each presentation if you want to make something that's 1:1 or 2:1, for example. But once you know it's there, you're not limited to a 4:3 or 16:9 canvas. Keynote alone is a reason for me to not switch to Windows—it's so much better than PowerPoint, both as a presentation tool and as an illustration/layout tool. Sadly, Apple dropped the ability to export animations with an alpha channel a few versions ago, but you can get around it by using a green or black background and applying a chroma or luma key in your video editor. Keynote is a fast layout/illustration tool when creating screen-based graphics or even basic animations. When I'm on a tight deadline or need a "quick 'n dirty" piece of art, I go to Keynote first because it's so quick to work with. I export animations from Keynote to Final Cut, because it's so much quicker than working in Motion. Yes, other tools give you more control, but they take so much longer to do the same thing that I can do in minutes using Keynote. "Great presentation tool for Apple users." Migrating over from PowerPoint or exporting tp PowerPoint has some limitations. I am glad I have a laptop to play it from but in the situations where I need to use a usb drive on a PC, I have to do a number of tweaks and of course you lose the features you will love in Keynote. if you have an Apple device, why are you using PowerPoint?! Give Keynote a shot and you will love it! Very easy to set up presentations I due for teams I train or audiences I speak to. Easy to make simple edits on my iPad or on my phone at the last minute, especially when saved on iCloud Drive. "Good slideshow and presentation software"
Has good design and is easy to learn for first-time users. Isn't as compatible as PowerPoint and Google Slides. Keynote is a worthy and comparable alternative to PowerPoint. It comes included with every Mac, Macbook, iPhone, and iPad, so anyone who has these products is able to just download it for free from the Mac App Store. This is a major plus, especially for budget-minded students who can't afford the fairly expensive Microsoft Office and PowerPoint. Even though its free, I would still recommend Google Slides and Google Drive over it because of collaboration and compatibility features that Keynote still needs work on. Google Slides has collaboration features that PowerPoint and Keynote can't compete with. PowerPoint is widely used among all ages, professions, and settings. When importing a PowerPoint into Keynote, a lot of times the fonts and formatting gets changed or altered so it doesn't look as it should. When exporting a Keynote file to PowerPoint .pptx, the same thing happens. So I would still suggest PowerPoint over Keynote to those who will be working with others who have computers of different platforms and OS's. Overall, Keynote is a really good alternative that's easy to use and has a lot of useful features. It's free, comes with plenty of templates, and is easy to customize. Compatibility and collaboration features are still lacking, so those who really need these should probably try other alternatives first. Comes with every Apple product, so is a free alternative to the expensive PowerPoint. "Keynote is great for presentations"
I like how easy and simple keynote is to use. I can make quick presentations for a meeting or presentation that I am about to give. You can easily upload and edit different media into your presentation. Keynote is also compatible with almost any file type. Keynote works really well on mobile devices too. I don't like that it is hard to create your own template and save it for future use. I use some of the same templates a lot and I have to recreate them each time. I also don't like how editing multiple items at once can cause some items to expand in size. If you select multiple items to move then sometimes it will resize everything to the same size. Give keynote a try. It is very easy to use. Keynote helps to create quick presentations for company meetings. "Best presentation app out there"
It's been the easiest to use for me as a designer who has created a lot of presentations for my companies. It's easy to make and design for. It has great version control to make sure I can always go back and revert to older better versions. And when it comes time to present, its been hugely reliable. I'd like Keynote to work for Windows users. When it comes to business people it seems everyone uses Windows. When I'm trying to work on a presentation with many stakeholders, this can be a big drawback. It's very different from Powerpoint. But it's worth it to learn it and make the switch. It will make your job easier. Keynote is great for creating presentations. Both for meetings, for events to show on large screens, and for sales. It's been fantastic for that. "Keynote = PowerPoint for Designers"
Keynote is a great little tool for building presentations. I'm not constantly building slide decks like the folks in sales and marketing, but I do use Keynote on a regular basis to communicate design standards, upcoming changes, and the like. It's simple, fast, and easy to use. It's pretty hard to find fault with anything Apple has built into Keynote. I guess my only complaint is that sometimes Keynote will garble files that were originally created, or edited at some point, in PowerPoint. Sometimes text or images will be out of place when this happens. Otherwise, it's a really solid application. See other notes in the review about compatibility with PowerPoint... otherwise, strongly recommend! We use Keynote to create presentations for both internal and external use. It saves considerable time over PowerPoint. "For a better looking presentation use Keynote especially if you like video clips"
Take the same person with limited artistic ability and hand them keynote and powerpoint. It's almost certain that the keynote slideshow they put together will look better than what they do with Powerpoint. It's cleaner, had better alignment indicators and the templates out of the box are excellent. My only concern is when you go up to present, for any reason that your laptop won't connect to the AV system you are stuck exporting your keynote into a different format. With that you will lose some formatting and if you have embedded video it most likely will not work. So it's not as supported as powerpoint is what my concern is here. You'll need to export as a PDF or use some of the iCloud sharing function if you need to collaborate but it's far better looking than other presentation software. We have to explain fairly complicated systems to clients and having clean diagrams and sometimes video makes all the difference in the world. Also, having nice looking templates out of the box allow is to focus on content rather than making it all look pretty. "Less frustrating than MS Powerpoint." Keynote is a breath of fresh air compared to PowerPoint. Everything is easy to get to and easy to use, and formatting is not a nightmare. Our marketing department is Mac-based, but I have no troubles converting to PPT or PDF for our PC-based sales team to use slide decks I create for them. At least, there have been no complaints that I've heard. I have nothing to complain about with Keynote. As I understand it, this is a no-cost product that comes with Apple's IOS. Still recommend. Our sales team is able to create a basic slide deck on PowerPoint, and then send it to me to "pretty up". I can easily use the PPT files in Keynote, set them up to look nice, and then convert the files back to PPT (or to PDF) for sales to use in presentations. If necessary, the sales team is able to easily edit slides after receiving them back from me. Seamless, easy, and no transfer errors. "Simple, intuitive and fast. " It's a great tool for making presentations, I love it. I like using it both for desktop and for iphone and ipad, it's very convenient for me. The lack of some advanced features to be used in the mobile version on iphone and ipad. It would be useful to be able to edit vector shapes. Another of the important things that are missing is the possibility of working on layers. One of the advantages I found is related to dynamic charts. I can create interactive graphs that allow you to verify the data during the presentation, and see the graph that updates dynamically. This is very useful in my work, I often need to show evolving data. I really appreciate the possibility of embedding video and audio. "Not perfect but better than the rest!" For a long time I disliked Keynote....I was really into coding and thought it was, honestly, just too juvenile. But since then I have been forced to use it, and it's been just fine - and actually more than just fine, it's pretty swell! Really simple, which is good and bad I suppose depending on what you're looking for, and a real intuitive user interface which is easy to train newbies on. Again, it's simple. Easy. No fancy gimmicks. The one thing I would change is the opportunities to customize presentations...they come from a standard palette of choices and I would like the option to be able to create my own from scratch. Decent stuff. Worth it if you aren't looking for anything fancy! Simple presentations that look professional and take very little time to compile! "Slick & Easy Presentations with Apple Keynote"
With relatively minimal effort, and an easier learning curve than PowerPoint, I can create a dynamic and compelling presentation. On the presentation side, I can control the presentation from my iPhone and even run the presentation directly from the iPhone if there's an AppleTV hooked up to the display. Unlike PowerPoint, I don't think it's possible to deliver a presentation in presentation mode, effectively creating a "view only" version for distribution to others. This might be possible, but if so, creating it certainly isn;t as linear as saving a PPTX in PowerPoint. It's free. No reason not to give it a try. Also, there are some great templates available from ThemeForest and CreativeMarket that help Keynote really pop. Quick creation of visually compelling presentations for a wide assortment of business needs. Both to present corporate data internally and to solicit business externally. I use Keynote when I'm presenting designs internally to my team. It's a simple and effective tool for communicating ideas with great options for presentation and animation. If you've used PowerPoint, you'll feel right at home, but it's simpler and easier to use. Keynote does fill a bit "stuck" in the conventions of Powerpoint. I often find myself messing with text formatting for much longer than I should have to in order to get things just right. While the tool works, it could definitely work better. If you're looking for a light-weight alternative to Microsoft Powerpoint, Apple's Keynote is a fantastic choice. I use Keynote to communicate ideas to internal stakeholders and team members. It's a great presentation tool when used effectively. "Advanced, creative slide show application "
There are endless possibilities to create a very creative and presentable slide show. I enjoy the fact that the software comes with the purchase of the MacBook laptop (after 2013) unlike Microsoft Powerpoint which is quite pricey. Easy to upload your slide show to iCloud and Keynote would be able to create a link that anyone can use to view it. An ability to collaborate through other applications such as the messenger and mail. Collaboration features needs improvement, only available for the Mac users which is understandable, however, would be much better if there was an option to edit it without a Mac. Need to purchase additional storage on iCloud if runout of memory. Very challenging to go from Microsoft Powerpoint to Keynote. However, if familiar with other Apple products such as Pages and Number, everything is very similar. I believe that to use the software to its fullest potential additional information is required - manuals or for instance, video tutorials. Difficulty exporting to pptx files as some of the features change dramatically. However, this can be avoided by exporting your presentation as a video file. There are some disadvantages to presenting a slide show from Keynote to video file and the major issue is the inability to view the notes for particular slides on your device. Creating very unique slide shows and presenting them to the public. Presentation is outstanding, many features that allow to improve the overall feel of the slide show. "The right presentation tool for a professional"
Keynote is heads and shoulders above powerpoint and any other presentation software on several fronts: Ease of use, excellence of design, and smoothness of transitions. The only downside is that it is Mac-only, meaning that the place you are presenting has to have a Mac with Keynote, or you have to bring your own computer. If you have an iPhone or iPad, you can control your own presentation from the podium WITH "laser pointer" effects and realtime drawing on slides. This can be very useful if used with care. Creating professional-grade presentations for lectures, speeches, and sermons that make you look like a tech genius instead of a cliche business person. It is impossible to make a super-sharp powerpoint presentation. No matter how you are at slide design, Powerpoint's clunky typography and transitions denigrate your design. "Custom Presentations in a Flash"
One of my favorite things about Keynote is the interoperability features that it can employ. I often work on presentations in Keynote on my Mac, but saving them in my iCloud means that I can edit or add to it from anywhere. 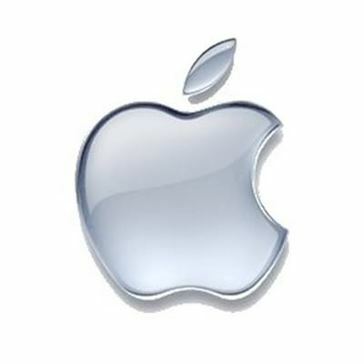 It makes creating presentations so much more convenient and Apple allows easy access to the software on the go. I also love the high level of customization that Keynote affords, especially as compared to Power Point or even Prezi. The predesigned templates are very visually appealing and useful on their own, but when it's not exactly what I'm looking for, I find that I'm able to better create presentations with the look and feel that I want through Keynote. The customization of color, font, theme, and slide styling is one of the abilities that makes Keynote as great as it is for me. .
For someone whose work is highly collaborative in nature, Keynote tends to not be great. Unlike Prezi, where multiple users can work simultaneously on the same presentation, Keynote is more of a lone wolf presentation software. I've heard collaboration features are in beta testing, but I imagine it will take a while to reach full potential. Keynote is a great product, especially for Apple iWork users, who will find it highly intuitive and easy to take advantage of all Keynote's customization features. For those who are less comfortable with Apple software, Keynote could prove to be more challenging and less user friendly than Power Point, but it's worth the learning curve if you want to create really beautiful presentations. Keynote makes great presentations for the workplace regardless of industry. I personally use it to create presentations for community groups and outside organizations to promote awareness of the collections in the library for which I work, but it can just as easily be used for any other business. In fact, it is probably more useful, with easy chart and data integration, things that aren't really found in library presentations. "One of main tools in my design arsenal for designing awesome presentations." I love the simplicity and the less is more aspect. You can create great presentations without banging your head on the desk due to crashes and searching for features. There are templates (not my thing, more into custom work) and it works well on my Mac. There is also a version that can be used online (used awhile ago). Newer features such as working via a team on a deck (currently designing solo), usage on a PC and on the iPad and a way to go live with your presentations via Keynote Live. I don't dig the templates, but some of the backgrounds are clean for a nice start. I don't like the fact that a lot of the clients I work with are afraid of it (not all, but some). I don't have a lot of dislikes since I have been successful using Keynote, but I do wish that typefaces were embedded (if so I missed that one) across the board for all users (the "other" software has the same problem for mac versions). I also use PowerPoint for presentation design and at times see a few things there that could be in Keynote or something similar. Just check it out. Check out videos or classes via Skillshare.com, Youtube.com, Lynda.com or Creative Live for lessons, ideas or tips/tricks. I'm able to create awesome yet functional presentations for clients all over. Benefits include a clean and simple interface and features such as Magic Move (with good taste). There are other creators that have created great add-ons for Keynote, but I have yet to really use them. I like its clean, logical and user-friendly interface. It feels really comfortable and practical, I can put a presentation together in like 10 minutes, and it has a very professional look afterwards. I like the templates too, it's a great help. It is missing some functions. Eg I just wanted to reduce spacing because it seemed too high, but the lowest I could go was 1.0 single spacing. I would have needed more like 0.75 for a good visual. Well, it's not really solving any other problems like Power Point would, I guess its just the preference, which one you enjoy more and which computer you have. But it has a nice finish and a very user-friendly interface. I love that Keynote has an autosave feature - it has saved me more than once. I also frequently use the 'save to PDF' feature, and the fact that I can save good/better/best makes the process much better (so I can send to brand partners without needing to re-save the PDF.) I really appreciate that Keynote feels more design-oriented and more intuitive than PowerPoint, which is what most people in our company are used to. They frequently comment on how 'clean' our slides look. I'm so used to how certain things work in Illustrator (that I use on a daily basis, vs maybe 2x a week) that I find myself wishing there were some features that aligned a bit better. The one I wind up getting frustrated with the most is that I can't grab multiple items and resize them all together. Putting together decks for Design Reviews, I'm dealing with a lot of images, so being able to just select them all, grab a corner, and make everything smaller would be fab. Same goes for resizing text - I wish there was a way to resize it other than just going to the drop down menu. My design team uses Keynote to present design reviews to our Brand Partners, showing all of the work and updates we've made over the past week or two. We rely on the quality and cohesiveness that Keynote allows us to have when presenting our work. We all prefer Keynote to PowerPoint, as it seems a bit more design-oriented. "simple, effective presentations on you ipad"
I use Keynote on the ipad, and I can tranisition easily to my laptop via icloud. the templates are fresh, the animations are smooth, and it is so much easier to edit and customize than powerpoint. if there are alignment tools, i have yet to find them. that would be a welcome addition. i especially like the ability to present via the icloud website. I can log in to my icloud account on a web browser and present with keynote so i don't need to bring my ipad, laptop, dongle or even a thumb drive. also? i can use my phone as a remote when presenting - so cool! i have done multiple presentations with keynote. it makes me look professional and my business look slick. "The easiest way to make great looking presentations"
I've been using Keynote for at least at decade. I switched from Power Point because Keynote makes better looking presentations, faster. As with all of Apple's office-replacement applications, Keynote has it's own quirky things that you'll occasionally stumble across that it just doesn't do, or can't do as well, or doesn't have the full level of true power-user level features as Power Point. Give it a try. If you are using a mac, it's free. Making a presentation is easy and you may find that it's a good solution for you. It may also help you to stand out from others who are making presentations that all look the same in Power Point. I use Keynote for presentations and also as a solution for doing easy page layout word-processing type applications. I make more documents inside of Keynote than I make presentations for sure. I dislike that not everybody has it so that people still default to powerpoint. It's also difficult that you can't have a shared theme across multiple keynote presentations. It would make it much more easier if you could that way branding would be consistent across the pages. Better than powerpoint for sure. It's worth a try if you find yourself always creating a presentation a different way each time. We provide presentations often so we need a software to build rapidly. It provides a polished and designed presentation to clients, customers, and stakeholders. "Keynote is user-friendly and has a sleek, professional design." I prefer Keynote over PowerPoint. It is easier to use and still holds all of the same functions and more. It's very easy to embed videos and URLs. The text formatting is really easy. This program is very quick to learn. I remember taking some time to get the hang of the ins and outs of PowerPoints. And this program came very easily for me. I find that it is pretty slow to save and open slideshows. There is also some format differentiation when I open the slideshows on different computers. Though I like Keynote more than PowerPoint, I still prefer GoogleSlides over all three. Keynote is our main program for presentations at work. It is a professional and sleek design. - Sometimes if you edit presentation simultaneously with other users, you can't see changes right now on desktop version of Keynote. Some delay can happen here. Definitely if you need great looking presentation and you have Mac - Keynote is a great way to do this. A lot of templates can help with design of your presentation. Simple and easy to use product that is free for Mac users. You can create beautiful presentations very quickly and have some interesing animations and effects that Powerpoint can't provide. "One of the best tool for presentations with Live streaming"
- Live streaming. Stream your presentation live only using link. Presentation live streaming can work not only on Mac's or Pc's but also on mobile. Just using browser. If you buy a new Mac you will get Keynote for free. You can share your presentations and edit this with web version using iCloud. Templates can speed up presentation creation, you don't need to be designer to create professional one. Keynote is a great tool for creating beautiful presentations with strong animations and huge variety of templates. Also it's great to share presentation between collegues during conference and follow it. Its way cooler than PowerPoint!! Its much easier to use... But the thing I like the most is the built-in animations and transitions... They are awesome!! You'll make extraordinary presentations in no time! Get it... Many Macs include it for free... If not, its worth every buck! I swear! We make better looking presentations and animated videos and in half the time with Keynote than with PowerPoint... Thanks to its intuitive UI and features, you´ll have plenty of editing options.. It really easy to use. you can learn by yourself... I did!! "Good app to make a quick slideshow from your phone"
The fact that you can make a quick presentation with so many custom options from the colors, textures, layout, etc. on your PHONE is definitely something to take note of. Not to mention, the wireless capabilities of streaming the slideshow or sending it anywhere makes it even easier, including the ability to use your phone as the remote to present the slideshow on different sources. Photo integration and collaboration is also a plus. The only thing I would dislike is how small it is but, given the platform, you do know you're doing it on a phone so you should expect the size to be smaller to work with. If you need the availability to get presentations together on the go or at your leisure, this is the app that I would suggest. Quick presentations/presentations on the go have become easy - even if they are just informative. "Everything you need for presentations"
The ability to work "on the go" on an iPad and sync changes via iCloud, the templates are very quick and easy to work with, integration with other MacOS applications (Photos, etc) works well. The ability to open PowerPoint files, once you get past the fact that they might not look quite right, is really good when working with non-iOS/MacOS users. If you have a "corporate standard" PowerPower deck then getting a KeyNote version is extra work (not that difficult, but font differences, etc. mean it's never exactly right), in a mixed environment with PowerPoint and KeyNote (PC and Mac) presentations don't always render the same way on different devices which tends to lead to KeyNote users creating PowerPoint "versions" of their presentations in order to be sure they can present. Mixed environments are difficult to manage and can lead to multiple versions of files as users "make sure" it will work (plus a PDF to be *really* sure!). The ability to make presentations on-the-go on MacOS devices (primarily iPads, but also MacBook Air's). Users are more productive with KeyNote than they would be with PowerPoint (on Office 365 for example). "Presentations are a breeze with Apple Keynote"
Keynote is easy to use, powerful presentation software available on macOS and iOS devices.I like that I can easily add slide transitions and effects, animate objects and even export as Powerpoint or a movie or PDF to share notes with my viewers. I can collaborate with other users via the recent Collaborate function via macOS, iOS or the web. Keynote Live allows me to share my presentation live via a web page link for remote viewers. If you are looking to a sleek alternative to the cumbersome Powerpoint and us a Mac or iOs device, Keynote is a winner. 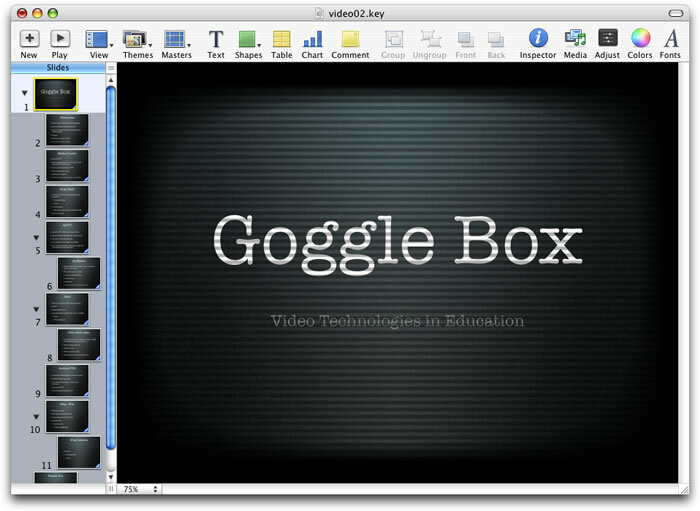 I use Keynote both in teaching classes as well as a training/presentation tool in my current job. I have also created video intros and outros with Keynote as well as animated info graphic style presentations. "Best software one can make presentations on"
I have been a Mac user for quite sometime and what I like best is the user friendly approach to making presentations on this software. You can add and remove images/object/texts without having to understand much. It can be restricted in some aspects if you compare it to Microsoft's PowerPoint like opening on various other operating systems. I definitely would recommend Keynote to others for the ease of use and the user friendly approach it has, just like any other Mac products. Being in the financial markets, I need to make presentations on various topics from time to time. I solve a lot of repetitive pitching by using Keynote to make presentations on subjects that I have to pitch to clients. The visual representation makes it quite easy for them to understand my strategies. I have been using Apple Keynote for a little over five years now, and I must tell you it is wonderful. I have been using this as a replacement for my presentations at work over Microsoft PowerPoint due to the number of options available with this incredible software. I love how you can literally customize your slides to make them flow really well with your presentation. It can make an audience's jaw drop. I dislike how little functionality there is between Apple and Microsoft products. When I want to use Keynote in an office when there is only Microsoft PCs available, it is very difficult. I wish Apple would provide alot of the installation drivers to Microsoft to allow for their product to work across all platforms. I am actively using Keynote to increase productivity in workplace meetings. I've noticed enormous benefits in terms of my message getting across to my students. Usually my people would fall asleep or not pay attention to what I'm saying because of some boring charts or text on the slides, but with Keynote they are actively engaged.